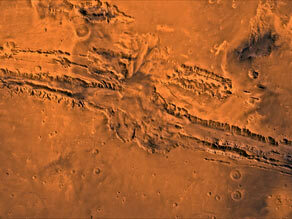 This is a Viking image of the Valles Marineris – which was discovered by Mariner 9 despite a global dust storm. The canyon makes our Grand Canyon seem puny – it spans 2500 miles and is between 3 and 6 miles deep. Thank you for sharing the wonderful photographs and informatin. the pictures of mars are great.I would like to see more,thank you. Mars Photo Album - Valles Marineris in 3-D!